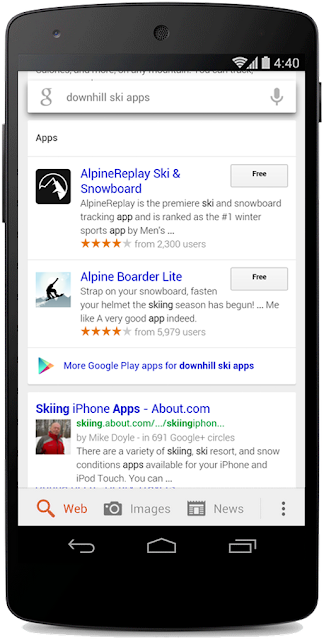 Google search will now display app results in addition to web results. Sometimes when you search for something via mobile, your best answer may be in the form of an app. That’s what Google is introducing into its mobile search. Now when you search for information via Google, Google can display results based on information from inside your apps as well as app results from the Google Play store. The new version of Google Search can be available for download here, however the app listing will also show up in Chrome. For example, if you’re searching for “James Stewart holiday movie”, Google can display the result from IMDB and open it directly via the right page in the app if you have it installed. However, for this type of search, Google requires you to be logged into your account so they can trace which apps you have installed on your Android. However, this feature is only currently working with 13 apps. These apps are AllTrails, Allthecooks, Beautylish, Etsy, Expedia, Flixster, Healthtap, IMDb, Moviefone, Newegg, OpenTable, Trulia, and Wikipedia. Also, according to TheNextWeb this is currently only available for “Android 2.3+ users in the US who have their language set to English”. Another exciting element Google is introducing to its mobile search is that when relevant, Google can also display app results from Google Play in Google search. It can display the result and link you directly to the appropriate group of apps for download. For example, you googled “best way to record calories” or “downhill skiing apps”, among the search results can be relevant apps grouped and displayed in the apps section. The introduction of deep-linking in search is extremely exciting. Google is trying to make its search a lot more cohesive on mobile. This is also super exciting for marketers because Google is making big moves for app discovery. Apps being featured and linked in search means ASO (App Store Optimization) will be more important than ever. There is now a much closer crossing between ASO and with SEO (Search Engine Optimization) on mobile. Mobile marketers and Android app developers should keep a close watch. As Google heads towards the direction to make search better for mobile, new channels and methods may open for increasing app engagement and marketing with an app via search. What are the Banned Words on Android?